Sign-ups are now open for Sponsors, Teams, and Players in the 2015 Alister MacKenzie Tournament, May 30 at Sharp Park, All proceeds go toward the ongoing campaign to save and renovate this seaside public golf gem. 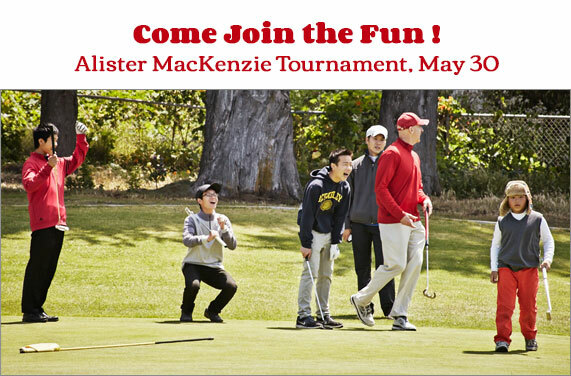 The $190 per player entry fee pays for a long day of fun, 18 holes of golf, a GREAT tee prize, and donation to the worthy cause of saving Alister MacKenzie's historic public Sharp Park golf links. The tournament format will be foursome scramble, gross score. We will have 2 shotguns: at 7:30 a.m. and 12:30 p.m., with BBQ lunch for all at Noon; the day will conclude with a silent auction full of great golf deals, heavy hors d'oeuvres, and other festivities in the Clubhouse. The tournament will be hosted by the San Francisco Public Golf Alliance, together with the Sharp Park men's and women's golf clubs, Pacifica Chamber of Commerce, Pacifica Historical Society, and the Alister MacKenzie Foundation. All proceeds go to our ongoing campaign to Save and Renovate Sharp Park Golf Course.